While you’re waiting for the batter to rest, this is a great time to make the warm topping and sweet cream filling. For the filling, I mixed 3T. powdered xylitol*, a dash of vanilla and 1 package cream cheese. I was making it a lower carb version, but regular powdered sugar would work fine! I also added 1T. half and half to mine, but I would add more next time to get it to a more spreadable consistency. *to make powdered xylitol, I took the regular xylitol crystals and put them in a small jelly size mason jar. I screwed the regular blender bottom onto it and blended until it looked powdered. Easy! Next put together the raspberry topping. I’ve done this with blueberries, too, and it was amazing. Take 2c. of frozen raspberries and sweeten it to your taste — I used 3T. powdered xylitol. I added glucomannon as a low carb thickener, but a sprinkle of cornstarch would work just as well. Add a couple tablespoons of water and let it cook on medium low until it gets all warm and thick and it’s ready to go! Once the batter is done sitting, heat your nonstick pan, then grease it and pour a bit of the batter into the center. Swirl the pan until it is completely covered with the crepe mixture. Let it cook for a minute or so until it looks done on the edges. Gently flip it (I used a spatula approved for high heat) and let the second side cook until very lightly golden. You don’t want to make these too browned or they won’t roll well. Spread the sweetened cream mixture on the inside and either roll or fold into quarters. Spoon the warm raspberry topping over it and indulge in deliciousness! I also made some with sliced bananas and Nutella and it was amazing. Next time I am going to try homemade lemon curd with a sweetened mascarpone to see if I can recreate an amazing crepe from a shop at our local market. I think I might also pick up some chocolate spread from Trader Joes and add sliced strawberries. The options are endless! Please tell me in the comments how you filled yours! Combine all ingredients in a blender and mix until smooth. 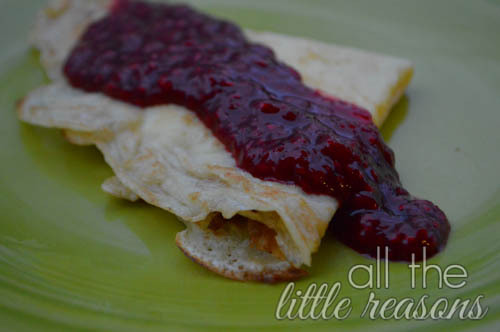 Refrigerate for 1-2 hours to allow for a more tender crepe. Once the batter has refrigerated, heat non stick pan and grease it with cooking spray or brush it with additional melted butter. 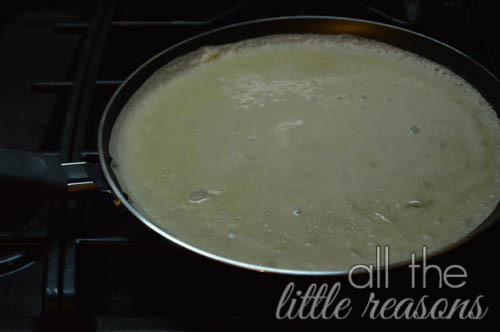 Put a puddle in the middle of the pan and rotate pan until the batter is spread out very thinly. Cook until it's a tiny bit brown underneath. Flip and cook the other side briefly. Grease each time a new crepe is made. 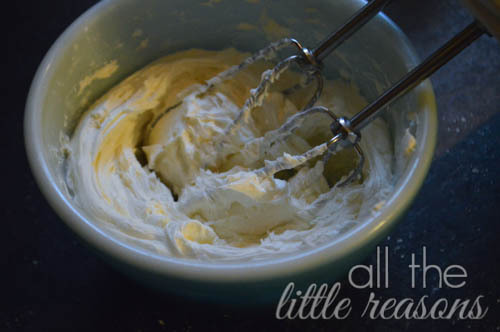 To make sweet cream filling, mix 1 package cream cheese, 3T. powdered xylitol or powdered sugar, a splash of vanilla, 1T. (or more) half and half, until it reaches a spreadable consistency. 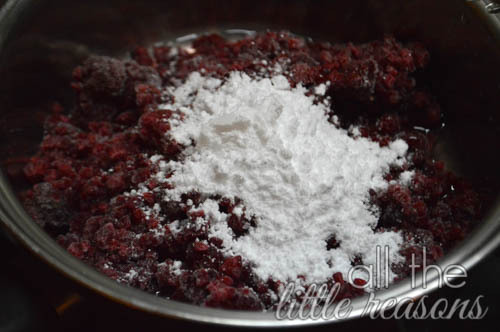 To make warm raspberry topping, heat 2c. frozen raspberries, 3T. powdered xylitol or powdered sugar, a sprinkle of glucomannon or cornstarch and a couple Tablespoons water. Heat until warm and bubbly. 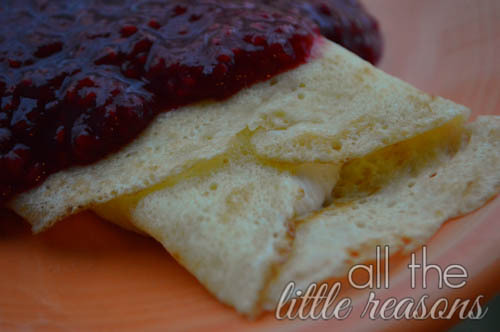 Spread sweet cream filling inside crepe and either roll or fold into quarters. 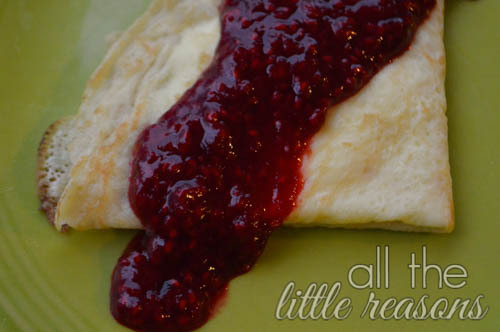 Top with warm raspberry compote. Joelle, these look absolutely delicious! Without knowing it, you are carrying on a family tradition!! When I was a child Mama used to make these for us – the Polish call them Nalesniki. We had them spread with home made strawberry jam and rolled up. I can still see her standing at the stove making them for 10 people – Daddy, 8 children and finally, herself. Thank you for bringing a sweet memory to mind! How awesome! I love that story….and poor grandma. I only made them for 5. I can’t imagine making double that amount! !